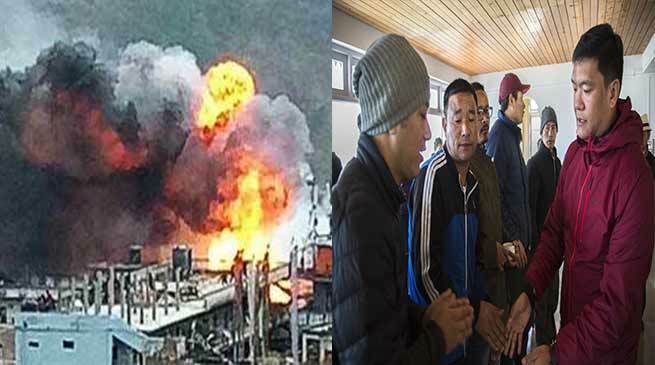 Chief Minister Pema Khandu met victims of the 27th January fire mishap at Dirang in West Kameng district here this morning in presence of officials of the district administration and public representatives. At least 50 houses and shops were razed by a devastating fire in the market area of Dirang township, which is thickly crowded and lined up with houses and shops on both sides of the road. Though no human casualty was reported, loss of property worth several crores has been unofficially estimated. Putting up at temporary relief camps and with relatives, victims of the mishap are slowly rebuilding their lives. Taking stock of the relief and rehabilitation measures initiated by the district administration and concerned departments of the state government, Khandu expressed his solidarity with the victims and offered the government’s assistance in rebuilding their lives. Interacting with the victims and people of Dirang, Khandu asserted that he was deeply pained on receiving the sad news and had constantly monitored the relief and rehab operations through the district administration. “I was in constant touch with local legislator Phurpa Tsering and had given him free hand to extend support to the victims,” he informed while lauding everybody who volunteered to help in dousing the fire along with personnel from Fire Brigade, SSB, NDRF, NIMAS and the district administration. Khandu assured that compensation for the loss incurred would be given to the victims as per official norms after completion and submission of the assessment report by the district administration. He, however, observed that the official compensation would be meagre compared to the actual losses incurred by individual victim families. He said, he along with Phurpa Tsering, will find out ways and means to add to the official compensation so that the victims at least get compensated at par with their losses. While expressing gratitude to the Almighty that there was no loss of life in such a devastating mishap, he however appealed people to be extra cautious with regard to fire as burning firewood and lamps is an integral practice in state, especially in the highlands. As a personal contribution to the rehabilitation process of the victim families, Khandu donated Rs 10 lakhs and assured more in the days to come. He also called on everybody to donate voluntary for the cause. The Chief Minister also noted that absence of a fire station in the Dirang valley is of concern and the state government is aware of it. He assured that process for establishing a Fire Station with sufficient fire fighters and fire tenders will be initiated at the earliest.